A video from TechnoBuffalo has sparked some controversy – stirring up a lot of whiny Apple fans. 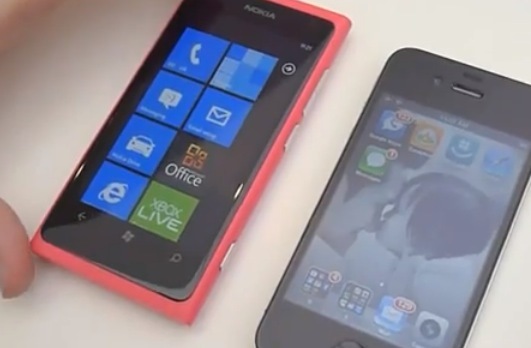 There are various funny comments such as “Compare the design of the Lumia with the iPhone 4S not iPhone 4” to which leaves me baffled as to what are the drastic design changes that would have mattered one slightest bit? The Apple fans are crying that the video is fake or has been doctored, the brightness apparently is set to low on the iPhone or that ambient light sensor should be turned off – or there are dirt on the iPhone’s screen making it look less responsive. The pinch zoom did look odd. As for screen – Clear Black, AMOLED. The screen does have nicer colours and deeper blacks than the iPhones IPS LCD. Don’t worry iFans. You should see Nokia’s AMOLED CBD screens against the pile of dogpoo HTC stuffs into their handsets and calls screens. There are complaints about the supposed icons that are equally boring on the lumia as they are on the iPhone, not realising that there are more to tiles than the stock coloured ones. The more apps you download, the more colourful the homescreen gets (especially with more dynamic live tiles). Then there are some that say there WP has no apps. Well, clearly there are. Read the comments themselves, they’re funnier. Just because someone didn’t outright say iPhone is the best thing since forever, they’re now attacking the guy. Let’s not forget how the iPhone invented everything. Multitasking, GPS, LED, video recording, video calls, wallpapers etc etc. 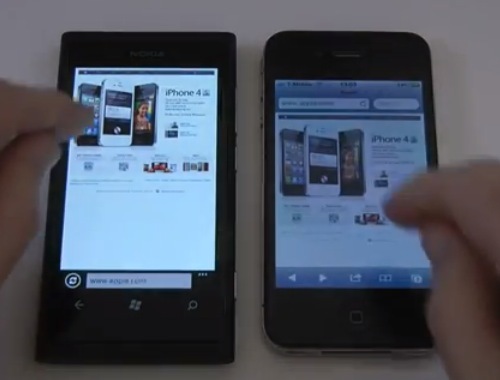 The guy demoing here – is that the same dude from Geekanoids who we saw previously had really liked the Lumia 800? The guy can’t help it if Nokia made an awe inspiring design (N9/800) which rivals the iPhone, to which he is not the only reviewer to say they prefer that Nokia design. If only Nokia and the original phone gangs could have made these iFans realise when pointing out features in bragging war, the old phones always had features their iThangs could only dream about, features their precious slabs of glass and has just recently produced that were already there in 2007. But clever misdirection on what counts and what is important is what Apple do best (that and making you believe you’re some part of elite crew of iOwners that are somehow better than everybody else). Here. Let’s take a look at a video with a 4S. The design is completely different to the 4 right and totally warrants that Technobuffalo should redo their video :s Do you know what else will look the same as the current iPhones? The next one of course. And what ever else Samsung has got cooking. Unless I’m missing something, what are the obvious changes between 4 and 4S that should you have 2 seconds to glance at either in the hand of a passer by you’d differentiate them so quickly? These two phones are vastly different. Go for which ever suits your needs best – that’s the one best for you. What’s best for you might be different to what’s best for someone else. But that’s life. It is possible for someone to prefer something else that isn’t an iPhone.